Visit San Angelo at any time of the year and you’ll soon discover there’s always something going on here. The local events calendar is jam-packed with some of the most exciting events in all of the Lone Star State. Discover many of the annual events in San Angelo worth traveling for, then start planning your trip to the pearl of West Texas. For a complete calendar that includes information on popular recurring events such as Cactus Market Days, planetarium shows at Angelo State University, and the Cactus Music Series, check out Visit San Angelo’s website. 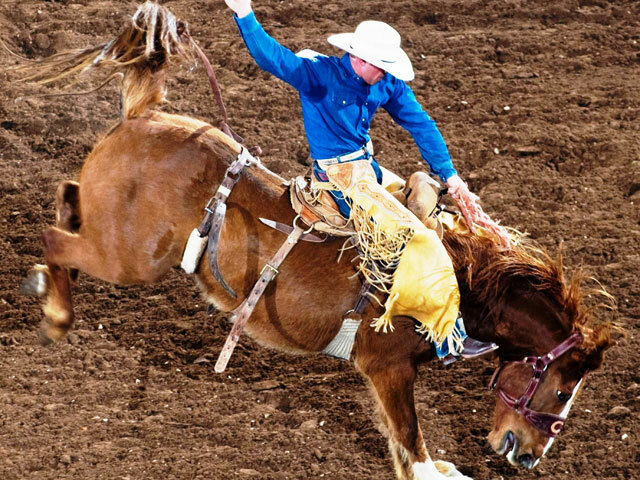 One of the top large indoor rodeos in the country, the San Angelo rodeo features Professional Rodeo Cowboys Association (PRCA) events, livestock competitions and sales, calf scrambles, slack, a parade, and much more. Local running club San Angelo Road Lizards hosts this annual race that includes a 50K, 10K, marathon, and half-marathon. Shopping, raffles, and a pancake supper round out this two-day tribute to bluegrass and a local pioneer of the genre. Enjoy excellent wines, craft beers, and fantastic food pairings from local chefs at the San Angelo Museum of Fine Arts. Tickets to this one-evening event are available online. On the second Saturday of May, get the blues in historic downtown San Angelo at this annual festival. In addition to the blues competition, there will be food, vendors, a car show, and a rib cook-off. This nationally televised annual drag boat race is a high-octane good time. Pro racers push their vessels up to 250 miles per hour while they compete for the top spot on the circuit. Texas’ longest running wake event celebrates all things boarding, surfing, and skating. Watch top athletes from all over the U.S. and Canada compete alongside youth and amateur boarders in this stop on the Tige Boat’s Endless Wave Tour. Complete the third leg of the “San Angelo Hat Trick” (the others being the Nasworthy and Goodfellow races) with this long-running triathlon in San Angelo. Party on the Concho at River Fest, featuring three concerts; washer, golf, and basketball tournaments; and kids’ activities including pony rides, a petting zoo, and bounce houses. Admire the largest collection of colorful waterlilies on display in the United States, and enjoy a fun evening of food, music, and wine at this popular annual event in San Angelo. Held annually the last weekend in October, the fiesta brings calf and match roping and a cowboy collectibles show to the San Angelo coliseum. Every year in late October, top-class artists from around Texas converge on San Angelo for this juried art competition. Throughout the event you’ll find artists painting in various places around town, including in the downtown area and along the Concho River. It all culminates with a chuck wagon breakfast and a final sale and exhibit of the works produced during the event. As the majestic butterflies arrive, head to San Angelo State Park for a weekend of guided trail rides and hikes, chuck wagon meals, live music and skits, auctions, and lots of photo opportunities. A new addition to the San Angelo events calendar, the festival is presented by the Vino Dipinte Art Gallery and includes live music, wine and beer for purchase, and fine art for exhibit and sale. Also known as the “Tour of Lights,” this month-long holiday extravaganza comprises a tree-lighting ceremony, parade, tuba Christmas concert, bike ride with Santa, fun run, and 2.5-mile display with three million Christmas lights. The fort’s biggest event of the year takes place over the first weekend in December. Christmas shopping, music and dance, crafts, and other activities augment a full line up of living history demonstrations at the historic fort.